This past long weekend, I made 2 different cabbage salads. The recipe below, I made as a side for some baked cornmeal-crusted fish and some oven baked fries. The other cabbage salad, I took to a picnic. I certainly can’t pick a favourite since I love pretty much any cabbage salad put in front of me, but since the lemon coleslaw recipe was new to me, it’s the one I’ll post here. The recipe as posted is directly from the Gourmet Cookbook. However, in my own kitchen, I made a few alterations, of course. I didn’t have any sour cream, so I just skipped it. I also didn’t add the sugar because I feel that low fat mayo already has WAY too much sugar for my own liking. I did add a dash of cider vinegar because I do like a zesty slaw but didn’t add the extra water. Water? Why? Regardless, it was a really tasty salad and I ate up the leftovers with a buttery english muffin the next day. 1. Whisk together sour cream, mayonnaise, zest, lemon juice, sugar, water, salt, and pepper in a large bowl until sugar is dissolved. 2. Add cabbage, carrots, scallions, and parsley and toss well. Chill, covered, 1 hour to allow flavors to develop. Season with salt and pepper. yum! i love a tangy cole slaw. 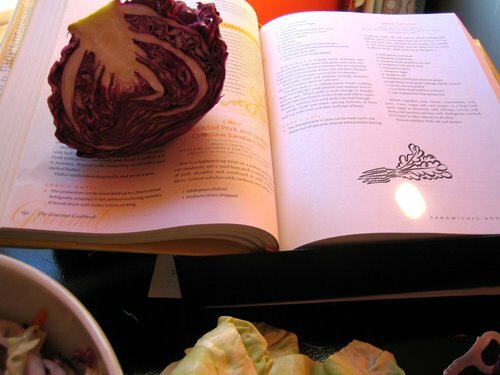 I love cabbage…though I do prefer it raw, still crunchy. I always add purple (why is it called red?) cabbage to my green salads…it just adds another dimention. I am certainly going to try your recipe. 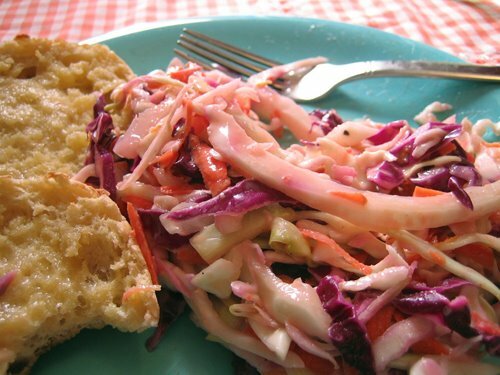 rachel, this isn’t the most tangy coleslaw, but it is quite nice and definitely lemony! jenn, raw cabbage is the best, for sure! okay, now I can’t decide between this or the feta-lime cabbage slaw recipe. Mmmm…it is for a potluck dinner so either would be good!